CU-P198 (N33534, built in 1945) of Expreso Aereo Interamericano. 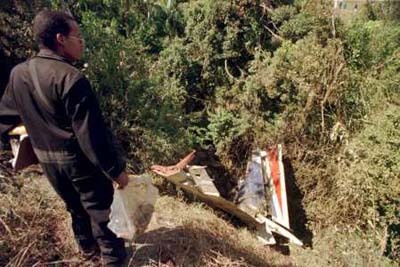 Crash when landing in Maiquetia-La Gloria, Venezuela. Carried two crews, but nobody die. 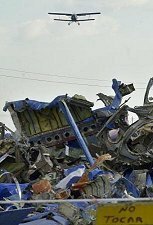 CU-T7 (N° 11646) of Cubana, in Holguin, crash in dense fog, without mortal victims. CU-T188 "Estrella de Cuba" ("Star of Cuba", N10368) of Cubana, collisioned by an Beechcraft aircraft of the US NAVY near Key West, Florida, that practicing to fly by instruments. 48 persons died, among them the Capitan Javier Zayas-Bazan. Is considered that that was a error of the Control Tower of Boca Chica, Fl., giving a wrong height to the american aircraft. The four crew of the Beech die too. CU-T397 "Estrella de Oriente" ("Star of East", N10319), of Cubana, in Bermudas. Crash at 5 km from the airport after take off, in a flight Madrid- Havana, with scale in Bermuda. All the 37 persons dead, including the Capitan Rene Ayala, who piloted the airship. Unknown cause. CU-C556. (No.264), of Cubana, in Rancho Boyeros, when landing. Without mortal victims. TI-1019. (No.33087. built in 1945), of Aerolineas Nacionales, in Havana; 35 mls hickjacked by rebels. CU-T603 (built in 1956, N91), of Cubana, in flight N°495 from Miami to Varadero, that take off at the 22.00h, and should be landing to the 22.49h, but was hicjacked by the rebels of the Movement "26 of July" of Fidel Castro. Crash without fuel in the Nipe Bay after trying landing in the darkness in the trail of the sugar factory Preston. 17 dead persons (4 crews and 13 passengers) of the 4 and 16 that flew. CU-C644 of Air Expreso Interamericano. Crash after the take off from Miami to Havana, with 2 crews and 2 passengers, but nobody dies. CU-T819 of Cubana. 22 dead persons (4 crew and 18 passengers) when take from Santiago de Cuba in route to Havana. In Isla de Pinos. 6 dead persons. CU-T830 (N.182004905, built in 1962), of Cubana, without victims, in Cienfuegos. CU-T827 (N401504) of Cubana, in Mexico City. 10 dead persons. Crashed after detonacion of an explosive on board. 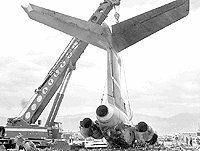 CU-T879 (N.67302501, fact in 1966), of Cubana, 5 dead persons (5 crews, without passengers). It collides in the air with an DC-8 by Havana. 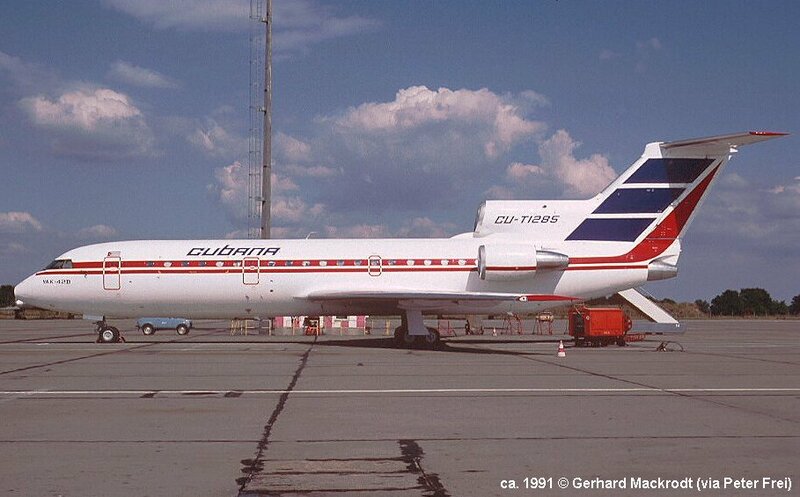 CU-T1200 (N.45638/156) of Cubana, without victims (16 crews and 13 passengers). The aircraft loses in the collision with a An-26 a part of the wing and a motor, but safe landed. CU-T1201 (ex-CF-DJI. 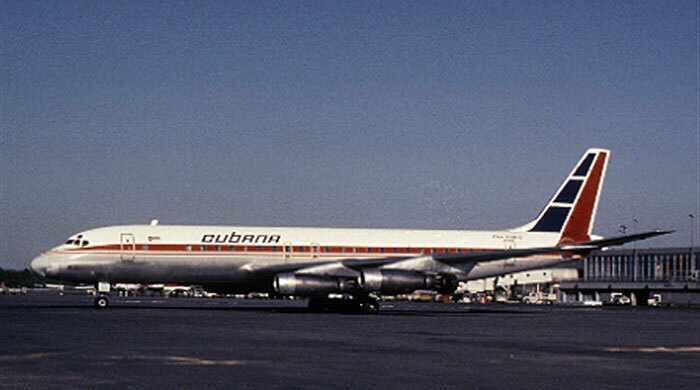 N° 45611, built in 1961), of Cubana after take off from Barbados. Is perpetrated a terrorist crime, when exploiting two bombs in the airplane. He crashed at sea in little distance from the coast of Barbados. 73 persons die (25 crews and 48 passengers). Although not be an Cuban airplane, we remember the Il-62 of Aeroflot (SSSR-86614) that crashed on May 27,1977 in Havana, when landing in Rancho Boyeros. 68 persons die (59 passengers and 9 crew) from a total of 70 persons, the most worse second air catastrophe in Cuba. CU-T1219 (N° 9840959. Built in 1978) of Cubana. 1 dead person (of 37 persons: 4 crews and 33 passengers) landing in Baracoa. CU-T322 (N° 147001642. Built in 1960) of Cubana. 3 crews dead, in training flight in Varadero. CU-T899 (N° 188011102) of Cubana. In flight Havana-Managua (Nicaragua) crashed after landing, in San Jose de las Lajas, at 8.22 o'clock. Fidel Castro take part in the burial of the victims. 41 dead persons. A motor fire in flight. CU-T1281 (N.3850453) of Cubana in Rancho Boyeros, Havana, at 19.00 o'clock. The airplane tries to take in rain and winds, and to the end of the trail a vertical descend wind does it to lose height and to be crashed out of the airport. 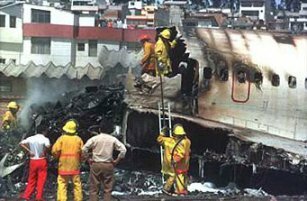 In total 160 dead persons: 126 from the airplane (11 crews and 115 passengers) and 34 neighboring of the place, at ground. Qualified like the accident N° 43 by the quantity of dead persons in all the history of the world aviation. The passengers were Italian tourists. This event provokes the decision of changing the head of the Cuban Aviacion Civil Institute (IACC). CU-T1436 (N.7406) of Cubana-FAR. From 41 persons, no victims. It is set on fire in ground in the airport of Santiago of Cuba. CU-T1202 (N° 931449, built in 1976) of Cubana in Punta Jardinero, Santiago de Cuba. 11 dead persons: 2 crews and 9 passengers (of 7 and 24 respectively). Pilot error, who decide to interrupt the flight by instruments and to continue visually, under bad conditions of the time and in mountain zone. CU-T1270 (N° 187010301, built in 1967) of Aerocaribbean in Puerto Plata, Dominican Republic. 34 dead persons (6 crews and 28 passengers). Tha airplane crashed to a 850m hill, when approach to landing. CU-T1262 of Cubana, in Santiago de Cuba. 44 dead persons: 5 crews and 39 passengers, among them 6 spanish and 2 brasilians. After the take off at 21.55 o'clock hours, one motor stop working, and the airplane crashed to the sea at few kilometros from the coast, in one of the points of greater depth of the Caribbean Sea. CU-T1264 (N° 720, built Dec.23, 1985) of Cubana in Quito, Equator. With 90 persons on board (76 passengers and 14 crews). Victims: 81 dead persons, including 9 neighbors of the place. 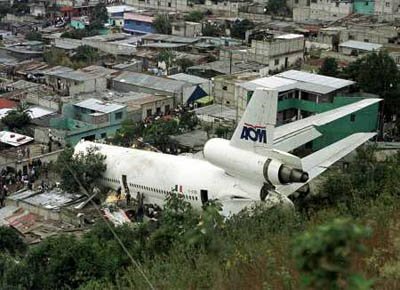 At 13.03 o'clock hours, after 20 minutes of various failed intents to take off from Guayaquil, the airplane not take height and crashed at home near the airport. The Ecuadorian President Jamil Mahuad arrive at the place. The Cuban General of Division Rogelio Acevedo, president of the Cuban Civil Aeronautic Institute, arrive at the Equator immediately. Acevedo inspected the zone of the disaster and interviewed for separated with the commander of the Ecuadorian Air Force, General Hernan Ballester, and with the president of the research comission named by the Ecuadorian government, Jorge Moreno. F-GTDI of Cubana-AOM, in the airport La Aurora, Guatemala City. At 10.00 o'clock of the morning, with 314 persons on board (296 passengers, almost all Guatemalan medicine students in Cuba, returning to pass the Christmases at home, and 18 crews). Was produced by pilot error, who landing at the center of the trail, and not have distance to brake, crashed falling in the adjacent town to the airport. 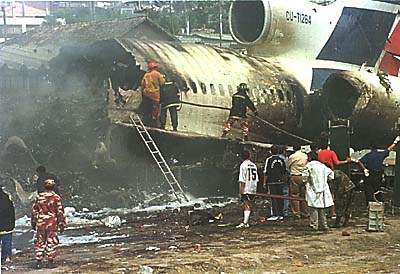 The result of the accident went of 26 dead persons (8 crews, 9 passengers and 9 neighbors of the place) and 44 injured. CU-T1285 (N° 4520424914068, built in 1991) of Cubana, in Venezuela. 22 dead persons (12 crews and 10 passengers). In flight since Havana and under badly time, collides with a hill by Bejuma, at 160 km from Caracas, and 15 km from the airport of Valencia, near the 20.00 hours of the night. Its capitan was Alberto Garcia Almeida and second capitan Marcos Herrera Hernandez. CU-T1020 of Aerotaxi. The accident causes 17 dead persons (4 Cubans, 5 British, 6 Canadians and two Germans). The airplane lost a left wing when flying at a height of 1000 m, in flight over a water reservation near Báez, Santa Clara.